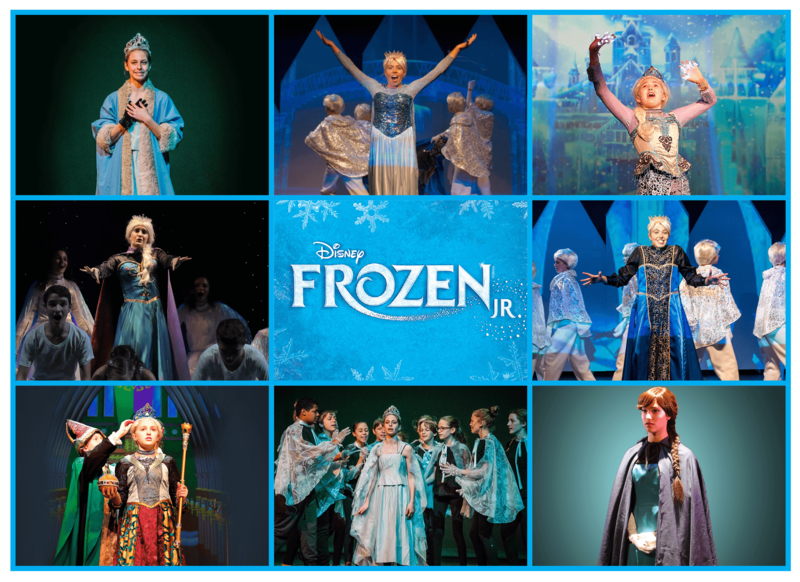 Frozen JR. features three iterations of the austere future Queen of Arendelle, and there are a myriad of ways you can achieve her signature looks cohesively amongst the three actors you cast as Young, Middle, and adult Elsa. 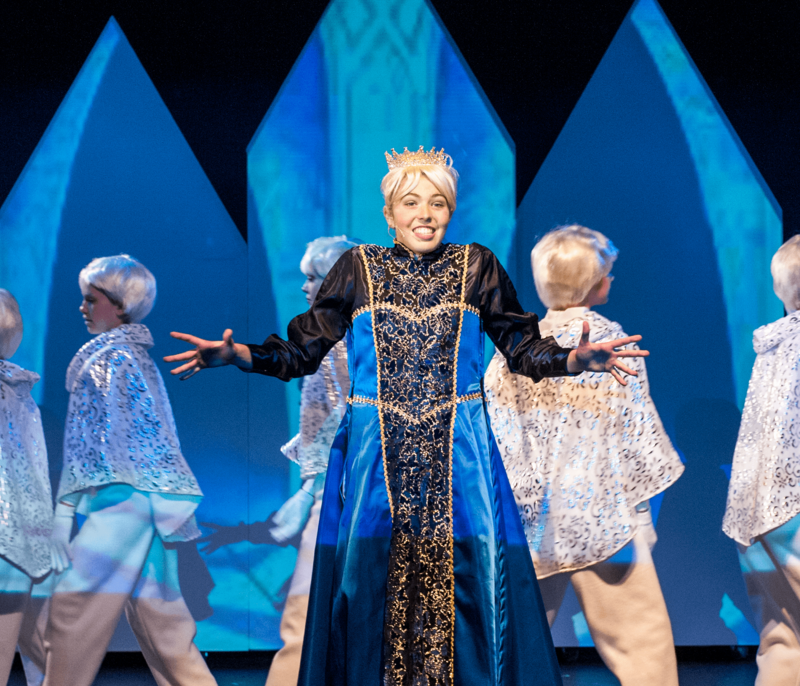 Each Elsa will also need a pair of gloves, given to her by her mother to help her control her powers. Elsa’s official gloves will soon be available at mtishows.com, or create your own pair to match your production’s costume palette. Cautious and conventional, Elsa may wear her hair pinned back for the coronation before “letting it go” loose later in the play. As with all young performers, styling the actor’s own hair works best. Though portrayed with silvery-blonde hair in the animated movie, there is nothing written into the script that indicates it is a necessity for Elsa. Have fun working with your own actor to find the various ways her magical powers can be embodied. And most importantly – have fun costuming this wonderfully complex and rich character! 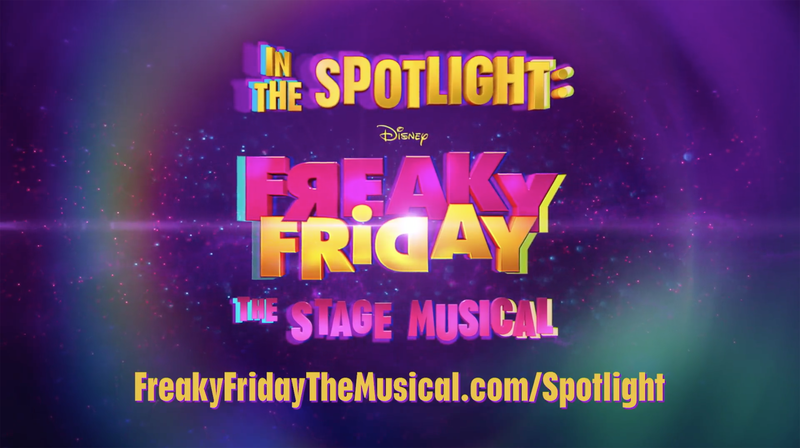 Join Cozi Zuehlsdorff from the Disney Channel Original Movie FREAKY FRIDAY as she follows Bradford High School and their production of FREAKY FRIDAY: The Stage Musical to the International Thespian Festival! 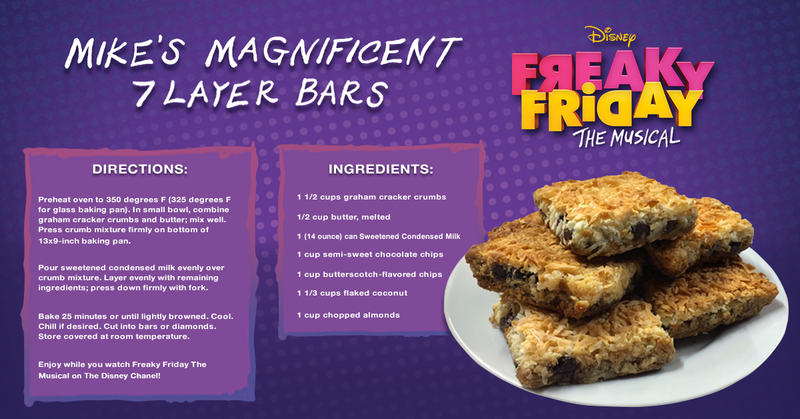 Make the most of your movie night by serving a platter of these delicious treats inspired by the Disney Channel Original Movie! Click Here to learn more about Freaky Friday. My decision to produce The Hunchback of Notre Dame with my students was driven as much by the life lessons they could learn from the story as it was by the opportunity it would give them to grow as artists. I consider it my responsibility to develop my students into empathetic and thoughtful young people who understand the power they have and the impact they can have on others. Hunchback provided the perfect training ground to help them discover how they can use the forces of their own human nature to bring about either oppression and abuse or justice and compassion. On day one of rehearsal, we began exploring the reasons why this story needed to be told in our community. Why us? Why now? This sparked a lot of conversation about my students’ daily experiences of bullying and social pressures that come from an age of constant social media intrusion. I discovered that themes like abuse of power, social exclusion, and prejudicial harassment were all too familiar to these teenagers; they experience them right in the palms of their hands multiple times a day. It wasn’t long before the cast started making clear connections between their own world and that of Paris in 1482. By the end of our first meeting, the cast had created their own mission statement that would drive the rest of our process: “We are doing this show because we want to become united in our acceptance of ourselves and those around us.” This statement stayed posted in our rehearsal and performance spaces until the end of the run, ultimately setting the tone for every rehearsal, meeting, and performance. 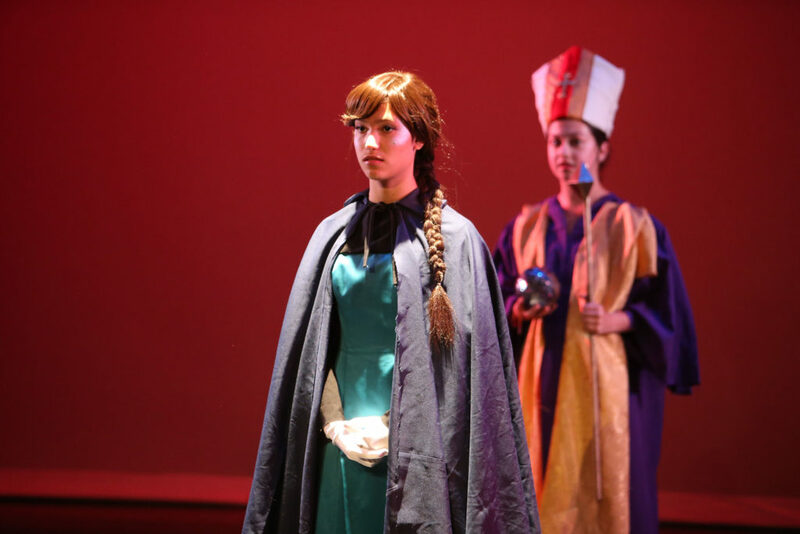 Perhaps one of the most difficult characters for a teenager to break into is Frollo. Guilt driven, sexually suppressed, abusive, and bigoted, Frollo is truly scary because he is so truly human. Yet the challenging work of unpacking Frollo, and ultimately empathizing with him in spite of his monstrous actions, might just be one of the most important tasks I have ever asked a student to take on. With the #MeToo Movement gaining momentum during our rehearsal process, the need to understand the Archdeacon took on particular relevance. I was fortunate to have a very thoughtful student in the role of Frollo. Through lots of discussion, the actor who played Frollo and I discovered the eerily simple factors in Frollo’s life that enabled his hatred and self-justification: a genuine love for his brother, a sense of obligation to a church that saved him from poverty, and a position of ungoverned authority. 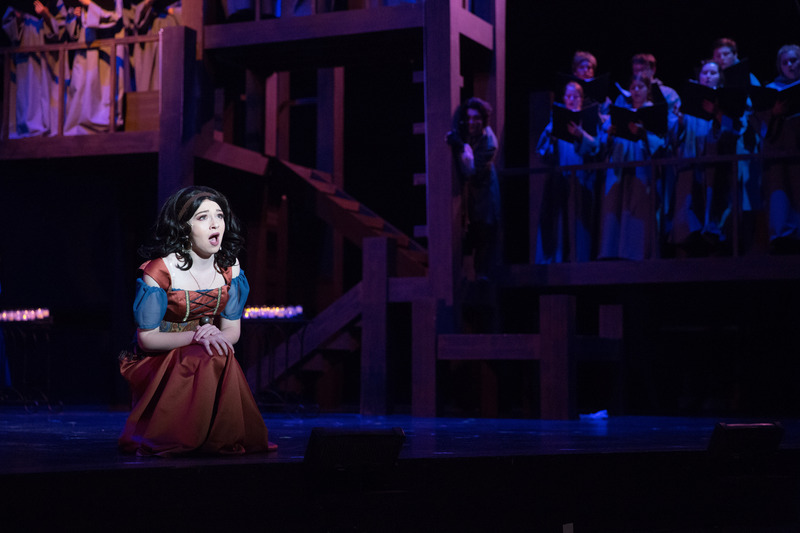 Discovering how easy it was for Frollo to reach a point where he could use his power to manipulate and abuse Esmeralda was particularly scary to the actor who played him in light of the abuses the #MeToo Movement was exposing each day. Frightening as it was for him to see how easily a man can turn into a monster, I believe the experience of playing Frollo will serve him well as he journeys into adulthood. 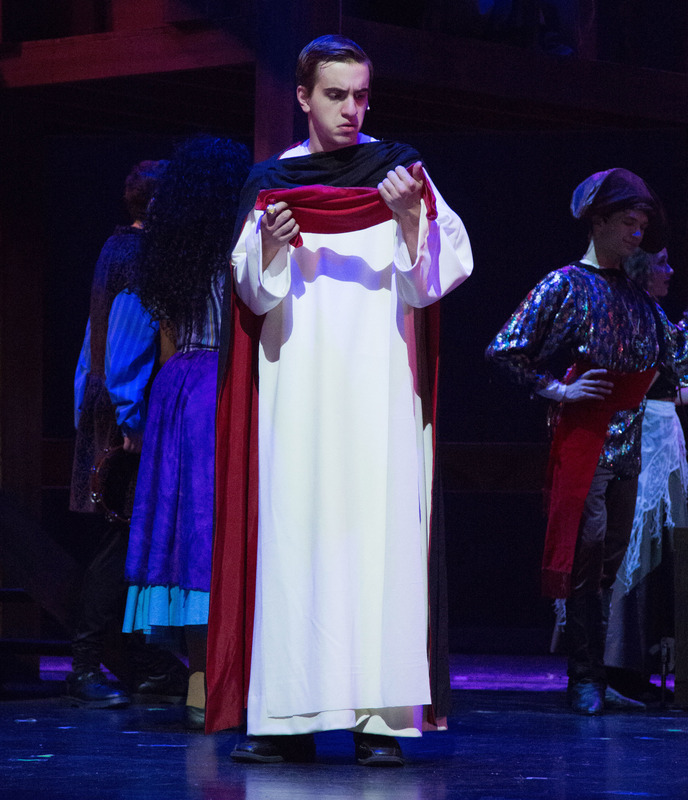 I see a great deal of self-awareness in this student and a desire to treat others with dignity, both strengthened by his time on stage in Frollo’s shoes. While our program trains many students for successful careers in theatre and other industries, it is most important to me that the success they have as professional adults be part and parcel with a positive impact on their respective fields. If I develop skilled theatre practitioners who are successful only in so much as they get lots of work but leave the world the way they found it, then I have failed as an educator. Stories like The Hunchback of Notre Dame are essential to preparing my students to go into the world and make it better. In the midst of our run, we witnessed the horror of the Stoneman Douglas shooting coupled with the heroism of Thespians from that wounded school who were conscious of their power and began to wield it to bring about positive change in our nation. Cell phones and social media, the same weapons of division that my students recognized on day one as central to their own experiences of hatred, began to be used by their own peers to propel a movement of peace and justice. As we closed our show amid a week of intruder drills and Snapchat threats to our school district, I found a sense of hope knowing that my students had learned two things while producing Hunchback: that they have power and that the dreams of “someday” can come about today if they wield that strength for the good of themselves and others. 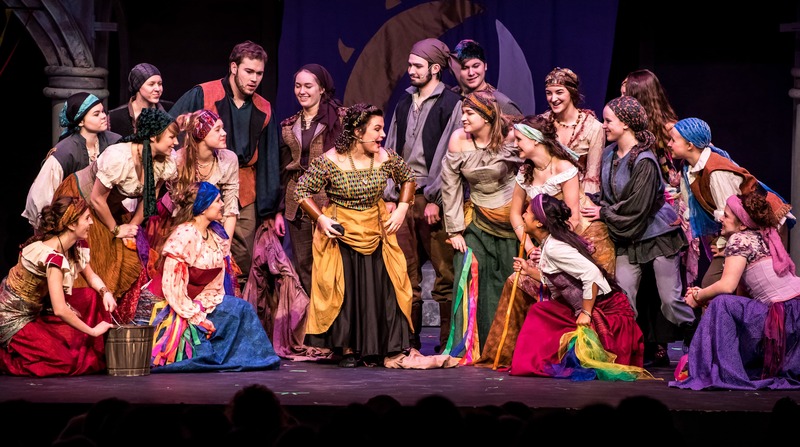 Indeed, the world will be kinder and love will be blinder if more kids are exposed to thoughtful Theatre Education, especially through shows like The Hunchback of Notre Dame. Robbie Steiner is the Director of Theatre Arts at Floyd Central High School in southern Indiana. Under his direction, Floyd Central has been recognized as the “Best Theatre School in the Midwest” by Stage Directions Magazine and was honored with the Outstanding School Award by the Educational Theatre Association in 2017. He currently serves on the Teacher Advisory Council at Actors Theatre of Louisville. 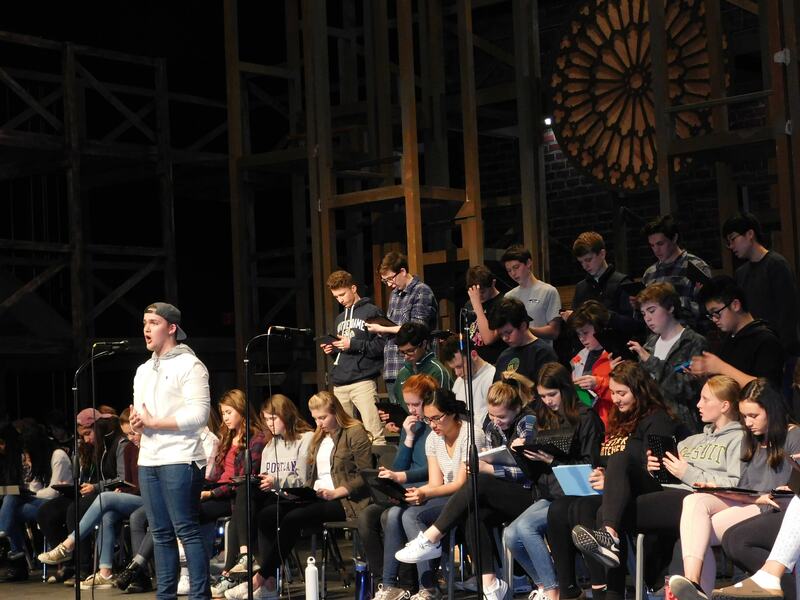 His work has been featured on the Main Stage at the International Thespian Festival, where Floyd Central’s production of Disney’s Newsies will be presented this summer. Robbie is a graduate of Indiana University. One of Mary Poppins’s mysterious and fascinating qualities is her ability to fly using her parrot-handled umbrella. There are many theatrical ways to achieve this that do not require hiring flying specialists, rigging wires, or breaking the budget. Remember, flying can be symbolic; there’s no need to be literal. Let’s explore! There are an endless number of ways to portray flying onstage, many of which have been around for hundreds of years. The Victorians used a see-saw, placing an actor on one end and then lowering the other side, creating the illusion of an actor rising magically. Mary could very simply stand on a rehearsal block to indicate flying. Or her silhouette could be cut from foam core and raised in the air to achieve the same effect. And there are myriad ways to portray flight with creative choreography. Every license of Mary Poppins JR. includes a ShowKit® of materials designed as a “Show-in-a-Box” – perfect for first time directors. ShowKit® contents include a Director’s Guide with staging tips and rehearsal strategies, a Choreography DVD – with select numbers fully staged. Below are specific DIY approaches to “flying” Mary Poppins. The greatest effects are only as stirring as your actors’ use of them to tell the story. If your actors are comfortable and confident enough with the effects to make them look easy, natural, and in control, the audience will buy the trick every time. 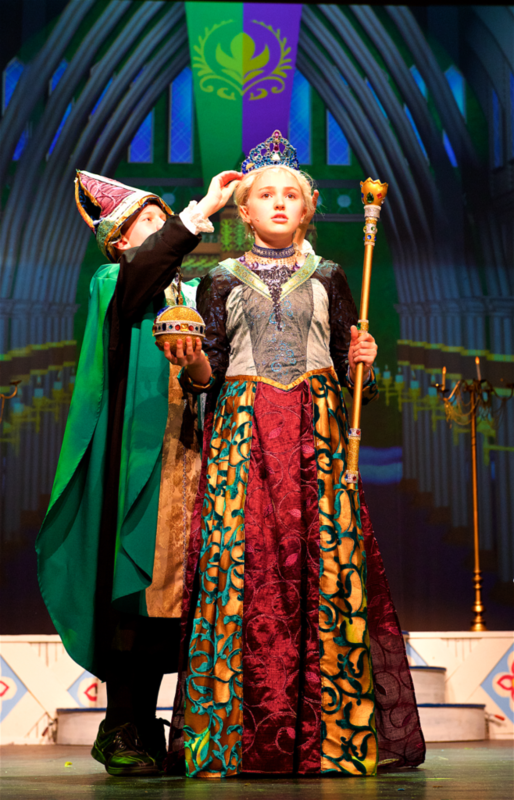 Allow plenty of rehearsal time for any magical moments in your show so that your actors can finesse any intricate moments and are able to perform them perfectly every time. In Scene 9, during the song “Chim Chim Cher-ee,” Mary Poppins “exits into the sky.” A fun way to achieve this is by using your actors to create the sky. Build handheld clouds on sticks for five actors. Stage them to enter using movement evocative of scudding clouds, and have them surround Mary Poppins, concealing her from the audience with their cut-out clouds. In the meantime, Mary Poppins can exit (unseen by the audience). The clouds open up to reveal that Mary Poppins is gone. This number is featured on the Choreography DVD in its entirety, so be sure to check it out to see how you can stage your ensemble to help create the magic. Using the Kite Flyers to manipulate the various kites onstage, you can make Mary Poppins appear from the sky by choreographing her to be revealed from behind a cluster of kites. See Choreography DVD excerpt, above. Many of the tricks used in “Let’s Go Fly a Kite” can be altered and used in Mary’s final departure. Mary could regally ascend up a staircase, rehearsal blocks, or various platforms so she can hit her iconic pose at the perfect moment in the music, significantly higher than any other actor on stage. Staging her alone on an upstage center platform would be effective. Remember to always employ the use of spotters any time an actor ascends levels onstage. Your ensemble can not only hide the set pieces Mary is stepping upon, but provide an additional level of safety for Mary. If you have any additional tricks or theatrical enhancements – like special lighting, atmospheric effects (like stage haze), or handheld practicals (like twinkly lights or small beam flashlights) – this is the moment to use them. With help from your entire company, Mary’s final flight will be the most magical trick of all. To be clear, under no circumstances should you or anyone in your organization try to theatrically fly an actor without a licensed professional on hand who is an expert in theatrical flying. Remember, if you’re stuck, ask your actors for ideas! You will be surprised at their clever and innovative suggestions! Using a little theatrical thinking and a lot of creativity, making Mary Poppins fly is simple, fun, and engaging for your entire cast. 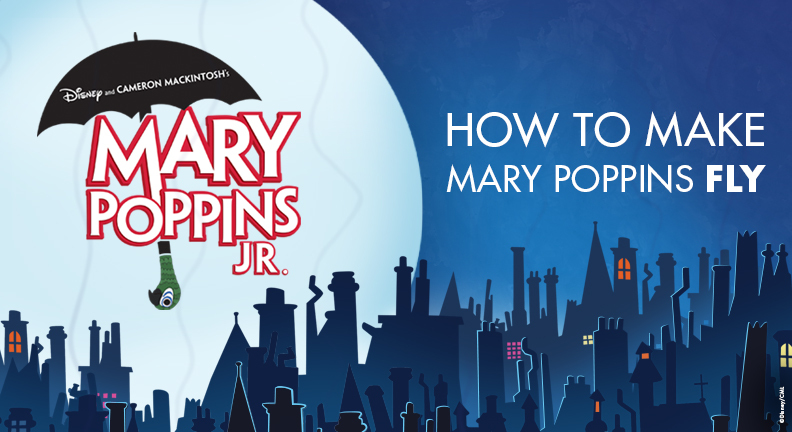 For more information about Mary Poppins Jr. visit the show page. I’m the Theater Director at Marist School in Atlanta, Georgia. 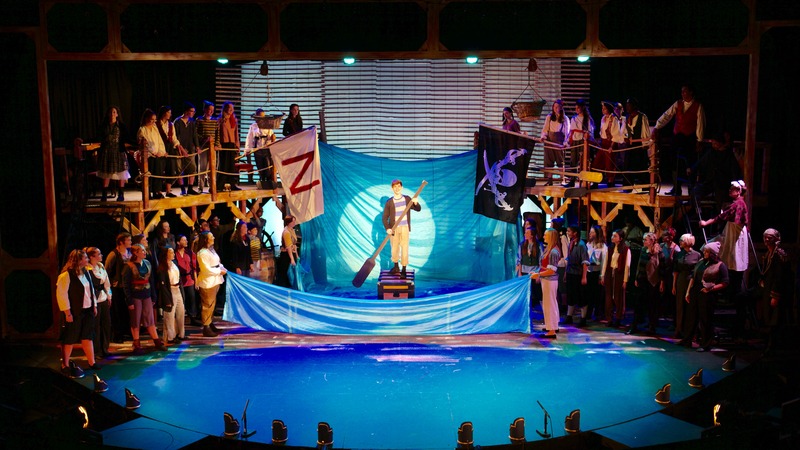 We recently produced Peter and the Starcatcher. It’s a show written to be performed by about a dozen actors. We did it with 49. On purpose. Our school produces about 4 shows per year for grades 7-12, and we have an unofficial “no cut” policy. Our school does not dictate that we do this, but we simply feel that it is the best idea for our community. Our students have a thousand choices when it comes to extracurricular activities, ranging from robotics and debate to sports and academic teams. Therefore, if a student comes to us and wants to be in a show, we work very hard to find a way to make it happen. This is an easy practice when it comes to musicals; one can always expand ensembles, divvy up solos, etc. The challenges are a bit more pronounced when it comes to plays. Peter and the Starcatcher was the perfect piece for us. Though only written for a small company of actors, the structure of the show is such that there are dozens – if not hundreds – of opportunities to contribute to the storytelling in meaningful and important ways. The show is also a celebration of what I refer to as “analog theatrical magic” – no automation, no digital projections, no lasers, etc. Big blue silk sheets represent the ocean. Dozens of lanterns become the starry night sky. A jungle is populated by an army of creatures, creating a rich and diverse soundscape. And don’t forget the sailors, pirates, and mermaids. Lots and LOTS of mermaids. None of these are revolutionary ideas, but they can be employed with this script in a way that both involves a lot of actors and assists in the storytelling, rather than get in the way of it. Thankfully, we have the world’s greatest team: our technical director, music director, costume designer, choreographer, and scores of generous parent volunteers all rose to the challenge of doing this show in this way. One other solution that we found to be helpful concerned the narration that occurs throughout the show. We found that spreading out the narration amongst the ensemble served several purposes. First, it gave lines to students who otherwise would not have a solo speaking moment in the show. Additionally, it prompted our audience to pay very close attention to the narration, as they had to follow their eyes and ears in order to know who was speaking. It also drove our actors to be very present, clear, physical, and, frankly, loud in order to distinguish themselves as that moment’s speaker. One of the big themes in our work here is that our cast is a team. We all work together to create something that is larger than ourselves, and each actor/component/element is valuable. When the narration is spread out amongst the company, the action grinds to a halt when someone isn’t there to do their part. When someone isn’t there – mentally or physically – to hoist a drape or manage the shadow puppets, the story is interrupted. Were there hiccups? Absolutely. We used a massive green drape to suggest the jungle in Act II, and one night the preset was incorrect and it got tangled up while rising in the air. It only delayed us for about 45 seconds…but it felt like 45 minutes. The magic of this particular problem was in watching the ensemble quickly diagnose the issue, come up with a solution, and continue with the story – all while keeping it in the world of the play. Another benefit of having a lot of actors in this show was that there were always a lot of hands available to help out in a pinch. 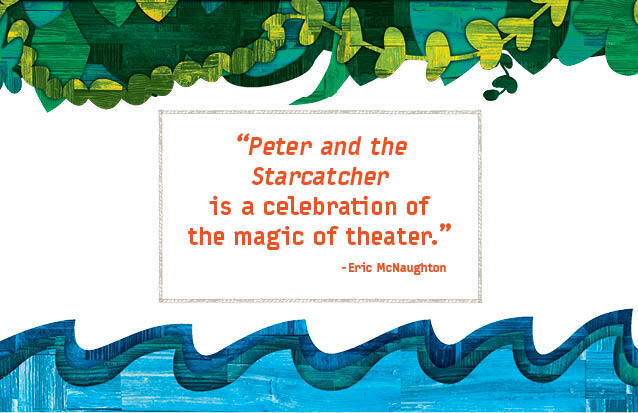 At the end of it all, Peter and the Starcatcher is a celebration of magic: the magic of youth, the magic of belief, the magic of friends, and the magic of theater. The Broadway production that I saw was absolutely magical for its doubling, quick character work, and stunning environment. Our students grabbed a few handfuls of starstuff and worked their own magic with this show. The waters may have been a little rough at times, but I cannot imagine navigating them without all 49 of them. Eric McNaughton holds a B.A. in Theater from Wake Forest University, and apprenticed at Actors Theatre of Louisville. He is the Theater Director at Marist School in Atlanta, GA, where he has worked on over sixty plays and musicals as tech director, co-director, or director. During the last few summers, he has performed at Lyric Theatre of Oklahoma, in shows ranging from Ragtime to Big Fish to Les Miserables. Last summer, he worked as Assistant Director for Disney’s When You Wish: A Celebration of the Disney Songbook, also at Lyric Theatre of Oklahoma. When the Disney animated film The Hunchback of Notre Dame premiered in 1996, its score was hailed by critics as some of the best work by composer Alan Menken and Stephen Schwartz. 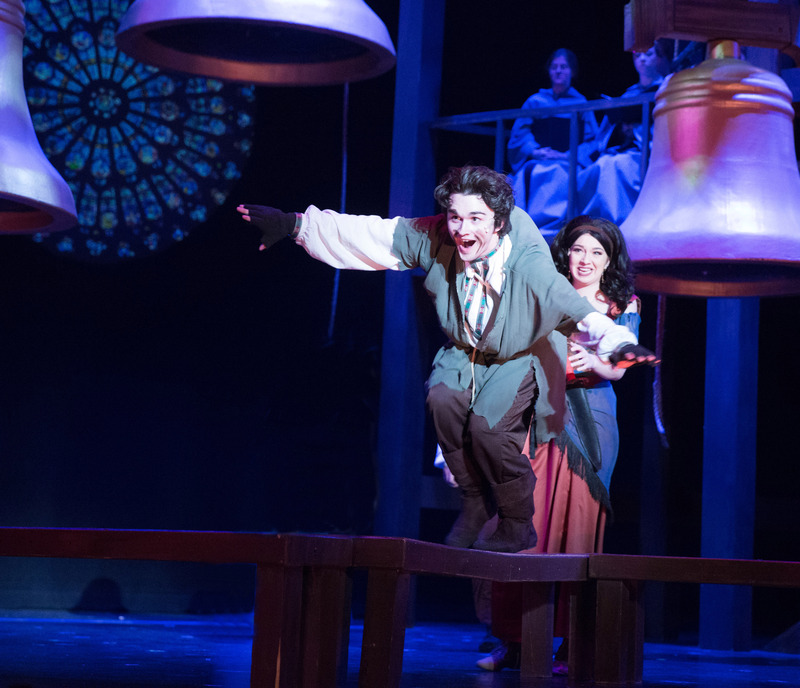 Twenty years later, Menken and Schwartz returned to their score and expanded it for the stage, this time bringing it closer to the tone and themes of the classic novel by Victor Hugo. 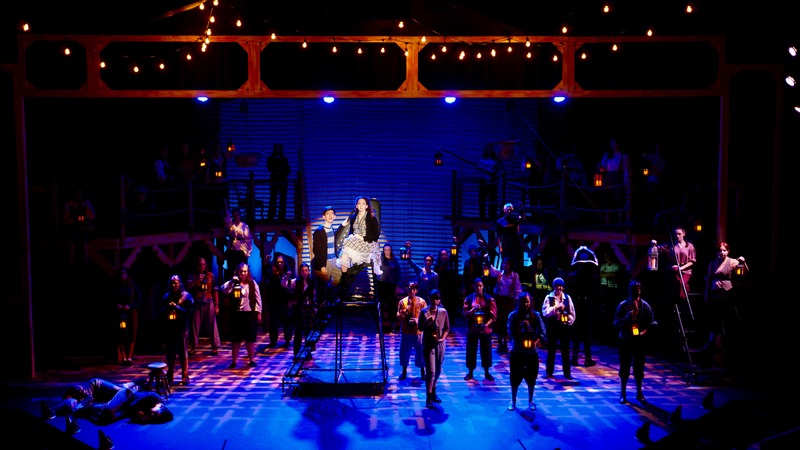 The stage musical features a Choir, present onstage throughout the show, very much the way the cathedral looms above the world of the novel. Since there are several different ensembles (or combinations of ensembles) throughout the show, the libretto utilizes the following nomenclature to help you along the way. Congregation: a troupe of storytellers, who serve as narrators; performers from this ensemble will become the principal characters, Gargoyles, Statues, Revelers, Soldiers, etc. The Choir is an integral part of the show and should be treated more as a character than an extension of the orchestra. 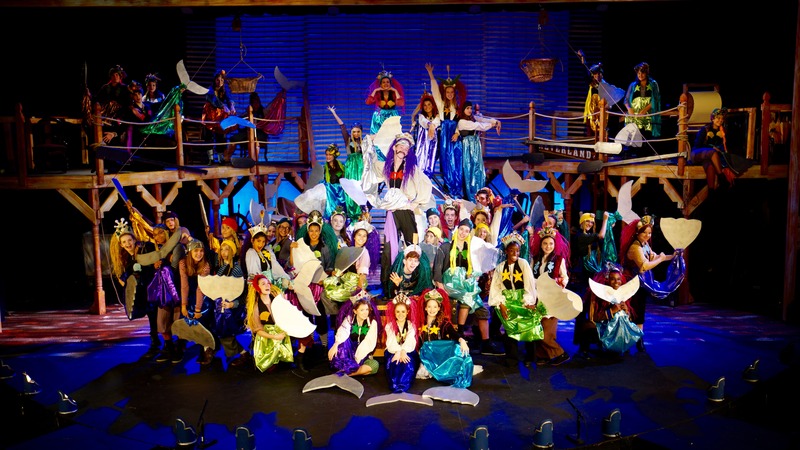 When casting your Choir, consider how this production can act as a bridge between your school’s theater and choral programs, strengthening each while encouraging collaboration between different student groups; or, how it can be an opportunity to partner with and learn about other performing arts organizations in your community. The ranges required for both the Congregation and Choir are about two to two-and-a-half octaves. In order to stay vocally healthy while singing this material, it is vital that performers incorporate a vocal warm-up into their routine. Use passages from the score or simple scale exercises to prepare for the rehearsal ahead. While in rehearsal, encourage singers to “mark” or sing at half-voice when they are learning notes and rhythms. This will help them preserve those high notes for when they’re needed most and alleviate vocal strain. Menken and Schwartz have created a dynamic score where your cast and orchestra can perform in styles as varied as Gregorian chant (“Olim”), Broadway ensemble (“Topsy Turvy”), Wagnerian opera (“Hellfire” and “Kyrie Eleison”) and contemporary pop (“In a Place of Miracles”). Now you can perform Menken’s melodic music and Schwartz’s nimble lyrics. Listen to the Original Studio Cast Recording via iTunes or Spotify. 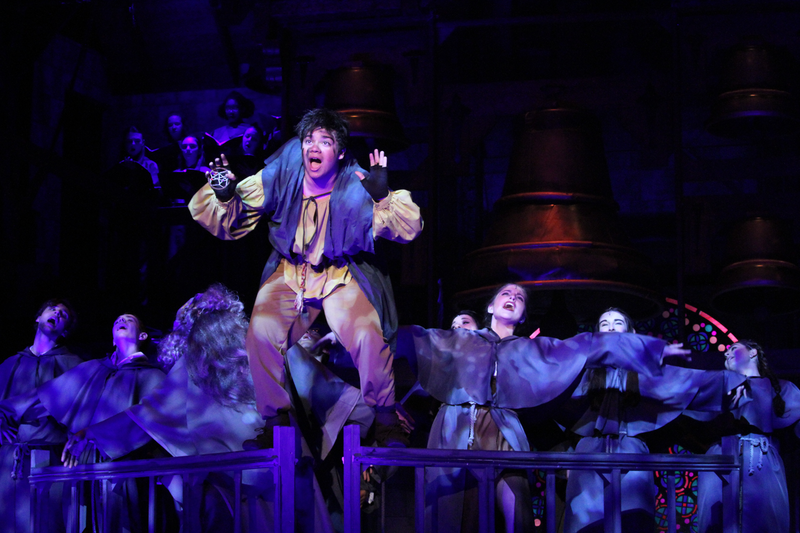 For more information about The Hunchback of Notre Dame visit the show page. Many hands make light work! 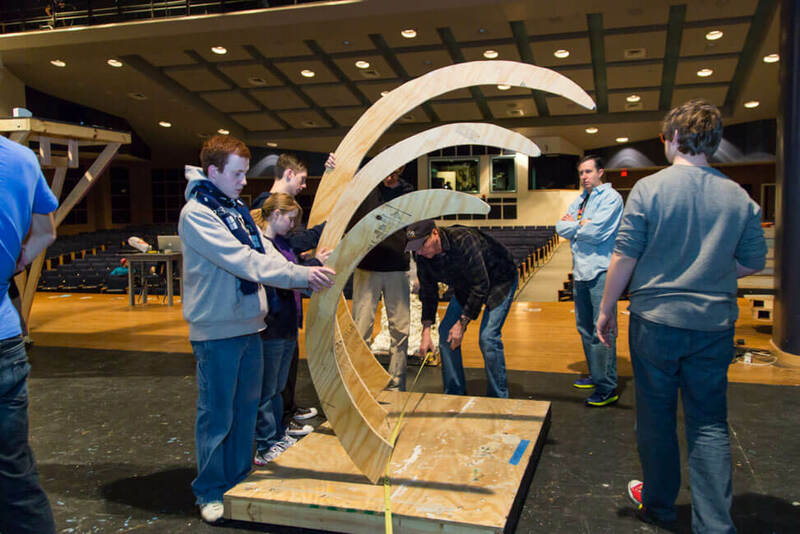 With sets to build, costumes to sew, and programs to fold, there is no shortage of work when producing a school play. Host a community night to help check it all off your to-do list. Invite parents and community members to paint the set, fit costumes and enjoy a sneak peak of a song from your show. 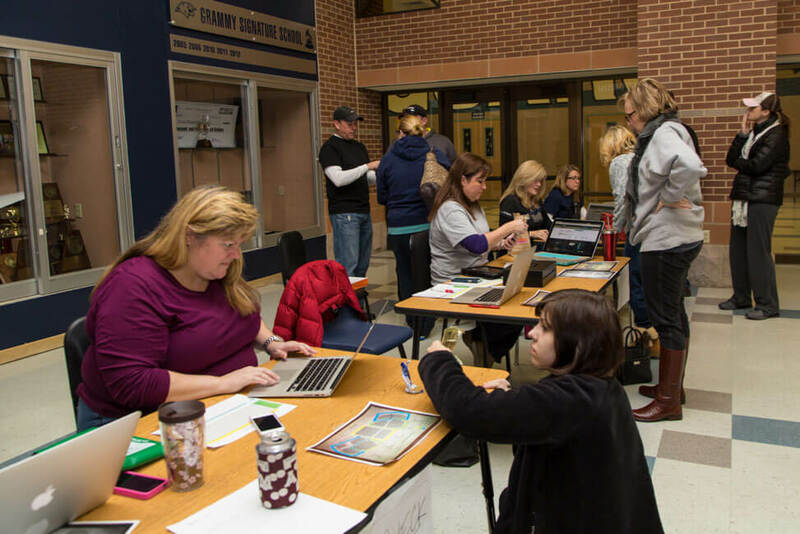 Organize a group of students and put them in charge of raising funds to keep your theater program sustainable. Students can sell ads in the show program or playbill, organize bake sales, and sell concessions to help fundraise for future productions. Drum up excitement for your production by engaging a group of students as the marketing team. Students can work in groups to create posters, promotional videos, online blogs, and social media posts to promote your show. Many students prefer the challenge and responsibilities backstage to performing. 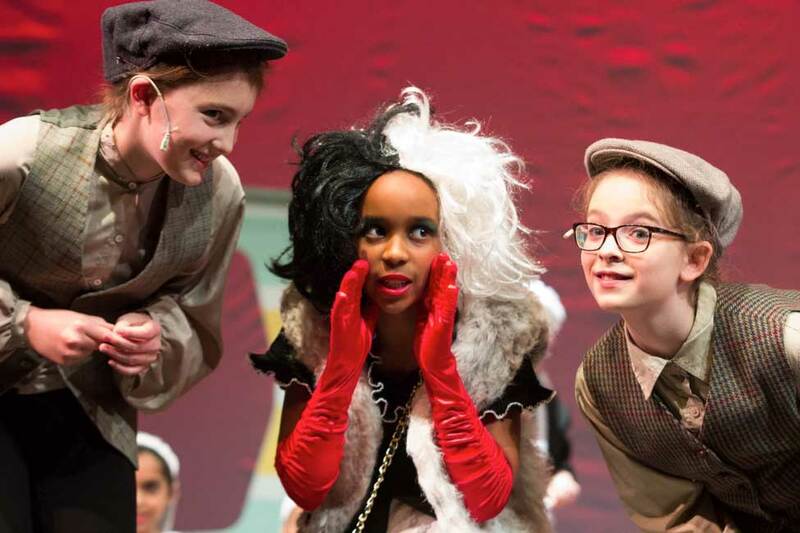 Capitalize on this enthusiasm by creating a student stage crew. 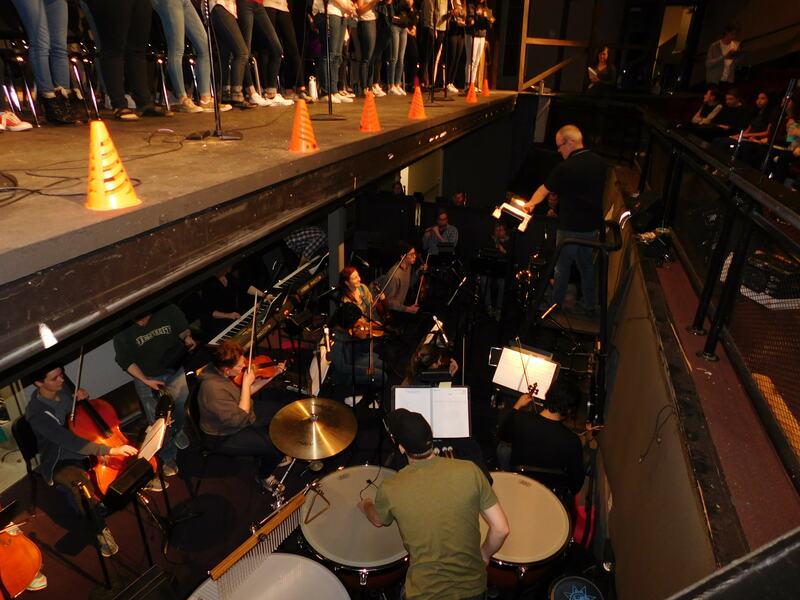 Backstage responsibilities can include operating the curtain, orchestrating scene changes, managing props and costumes, and operating lights and sound. You’re in the entertainment business, so hospitality is a must! Recruit students and parent volunteers to serve as ushers, ticket takers, and box office representatives for your show. This group of students and adults is responsible for ensuring a smooth audience experience at each performance and can additionally be responsible for creating your show’s program and tickets. 1. Hold a pre-audition workshop where you teach everyone an audition song and some fun choreography. This is a great way to introduce kids to the audition process without all the pressure of an actual audition. 2. Offer a backstage tour and a technical theater workshop, then recruit your stage crew from the kids who show interest. 3. There’s nothing like a personal invitation. Simply approaching a student and saying, “I really think you’d have a great time in our upcoming musical – will you audition?” can really make a difference. 4. Have your students perform a number from last year’s production at an assembly, the mall or any place families gather. Hand out flyers announcing your auditions for this year’s show. 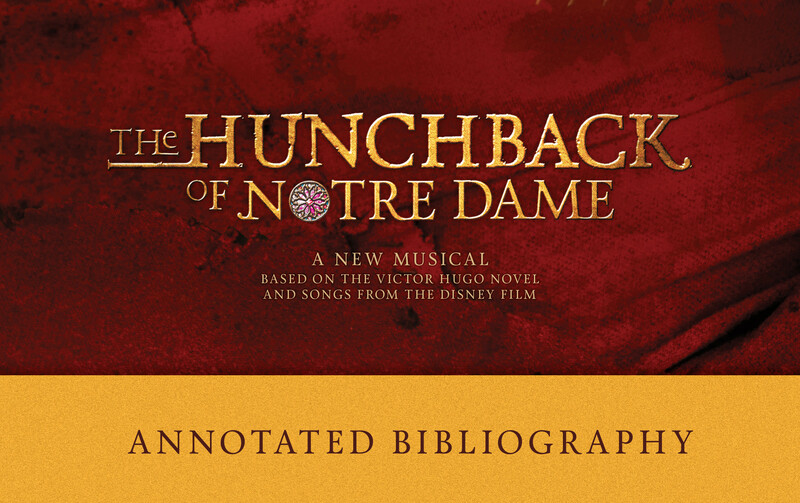 Below is a list of resources to get you and your cast started in exploring the world of The Hunchback of Notre Dame. Consider encouraging your actors and designers to do further research on the topics they are most interested in or that best relate to their characters or roles in the production. “Catechism of the Catholic Church” : A complete list of the catechisms of the Church compiled by the Vatican. “Cours des Miracles” : A short description of the 17th Century Court of Miracles. Everybody Belongs: Changing Negative Attitudes Toward Classmates with Disabilities: Arthur Shaprio’s book, published by Routledge in 2000, explains how familiar childhood characters like Captain Hook and Porky Pig shape attitudes toward disability. He offers practical guidance to schools that are wrestling with how to integrate children with disabilities. This style guide will lead you to the appropriate language to use when discussing disability with your cast. A Social History of Disability in the Middle Ages: Cultural Considerations of Physical Impairment: This book by Irina Metzler, published by Routledge in 2015, discusses what it was like to be disabled in the Middle Ages. Stumbling Blocks Before the Blind: Medieval Constructions of a Disability: Edward Wheatley’s book, published by University of Michigan Press in 2010, explores French practices and institutions that led to the commodification of human sight and inhumane satire against the blind in French literature. The Art of The Hunchback of Notre Dame: Written by Stephen Rebello and featuring art from the Disney animated film, this 1996 book traces the history of the movie and shines light on the animation process. “Bells Are Ringing” : Ellen Lampert-Greaux’s 1999 article from Live Design magazine profiles the technical elements of Der Glöckner von Notre Dame. Stephen Schwartz Comments on Disney’s The Hunchback of Notre Dame : A collection of questions posted on Stephen Schwartz’s online forum about The Hunchback of Notre Dame, with answers by Schwartz. “The bells, the bells…! Why Notre Dame is ringing the changes” : A succinct history of the bells of Notre Dame from the Independent. “Facts on the Notre Dame Cathedral in France” : A short history of the cathedral from construction to restoration from USA Today. “Gravely Gorgeous: Gargoyles, Grotesques & the Nineteenth-Century Imagination” : Part of Cornell University’s architectural photograph collection, this site explores Gothic architecture, including Notre Dame’s gargoyles and chimera. “New Bells Restore Old Harmony” : An article from Deutsche Welle detailing the replacement of Notre Dame’s bells for its 850th anniversary. Notre-Dame de Paris : Notre Dame’s official website which includes historical information about the cathedral. The Victorian Web : An overview, with images, of the architectural work completed during the 1845-1864 restoration of the cathedral. Paris: The Biography of a City: Colin Jones’s illuminating history, published by Penguin Books in 2006, offers a comprehensive and colorful look at the French capital, including its time during the Middle Ages. Paris in the Middle Ages: Published by University of Pennsylvania Press in 2009, this book by Simone Roux and translated by Jo Ann McNamara chronicles the lives of Parisians as the city grew from a military stronghold in 1214 to a city recovering from the Black Death of the 1390s. Women and Power in the Middle Ages: Published by University of Georgia Press in 2004, editor Mary C. Erler compiled a collection of essays that explore the power and activism of medieval women. The Gypsies: Angus Fraser’s 1995 book, published by Wiley Blackwell, provides an in-depth study of the diaspora and history of Roma in Europe until the end of Communism. Kopachi.com : Romani author Ronald Lee’s website provides articles about Roma by Romani authors, as well as music, publications, and links to useful other websites. We Are the Romani People: Written by Romani author and scholar Ian Hancock, this book, published by University of Hertfordshire Press in 2002, offers an excellent introduction on the origin, history, diaspora, language, and customs of the Roma. Sanctuary and Crime in the Middle Ages: Karl Shoemaker’s book, published by Fordham University Press in 2011, explores sanctuary law’s foundations in late antiquity and emergence in the early Middle Ages. “What It Was Like to Seek Asylum in Medieval England” : This 2015 Slate article by Eric Grundhauser offers a fascinating and concise history of sanctuary law. Society of American Fight Directors: The Society of American Fight Directors is an internationally recognized organization dedicated to promoting safety and excellence in the craft of stage combat. Contact your SAFD region representative for training opportunities or hire one of their certified teachers to help design your combat sequences. The Life and Adventures of Nicholas Nickleby: The Royal Shakespeare Company’s legendary 1980 stage production of Charles Dickens’s classic, released on DVD in 2002, is one of the most famous examples of the story theater form. Paul Sills’ Story Theater: Four Shows: This volume, published by Applause in 2000, includes the chapters “Designing for Story Theater,” “Music Notes for Story Theater,” and “Theater Games for Story Theater” (created by Sills’s mother, Viola Spolin). “Story Theatre”: This 2015 article by Rosalind Flynn on About.com details the history and conventions of the theater form. Story Theatre: Another famous example of story theater, this play by Paul Sills with music, published by Samuel French, was adapted from famous fables from the Brothers Grimm and Aesop. The 1970 Broadway production featured a cast of eight actors performing a total of 66 speaking roles, ensemble roles, and sound effects while assisting with – and performing as – set pieces. “The Gothic Revival in France, 1830–1845: Victor Hugo’s Notre-Dame de Paris, Popular Imagery, and a National Patrimony Discovered”: An essay by Julie Lawrence Cochran on the impact of the images from Hugo’s novel on French views on architecture, from the 1999 anthology Memory & Oblivion. “How a Novel Saved Notre Dame and Changed Perceptions of Gothic Architecture” : Architect Richard Buday’s article in ArchDaily describes the relationship between the cathedral and the novel. The Hunchback of Notre-Dame: Released in 2002, Catherine Liu’s new translation includes sections of the novel traditionally omitted from English translations as well as an introduction by Elizabeth McCracken. “Notre-Dame de Paris: The Cathedral in the Book”: A journal article from the Winter-Spring 1985 issue of Nineteenth-Century French Studies by Illinca M. Zarifopol-Johnston that provides a literary analysis of Hugo’s use of the cathedral in the novel.